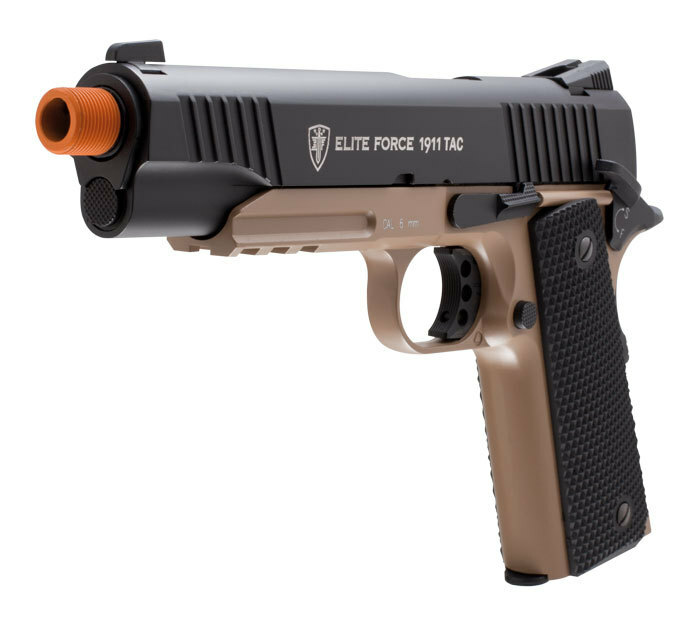 Elite Force is a versatile airsoft brand that offers a wide array of products such as pistols and rifles (in both AEG and CO2 format), parts, accessories, kits, and ammo. The focus is on quality and performance with all their products, which is why, to a beginner, Elite Force weapons may look a bit expensive. Still, if you’re serious about becoming an advanced airsoft player, an Elite Force gun may be the perfect choice! Their airsoft weapons, accessories, and ammo are among the best on the market. Moreover, lately, they redesigned a lot of their rifles and pistols to make sure they keep up with modern times. From added vents that help maintain the airflow to AEG motors to better crane stocks and faster options for battery change on the field, Elite Force wants to make sure your airsoft gun will remain reliable. Also, I like that they are open towards the airsoft community and offer advice and additional information through their YouTube channel and other social media channels. Most of their products are reliable, use quality materials, and perform as advertised. While it’s true that there may be some duds in some of their product series, Elite Force is a brand focused on quality and constant improvement. Since the offer is so varied, it’s difficult to pinpoint one specialty. They have amazing rifles and pistols (both AEG and Gas) and their weapons bear the markings of real-steel weapon producers. For instance, right now, they use the licenses for Beretta, HK, Walther, VFC, Amoeba, and IWI. As I already mentioned, Elite Force airsoft weapons may look a bit high-priced for a beginner. Still, for the regular airsoft players, their prices are just right. For instance, you can buy a good quality GBB pistol at about $100+ and a good AEG rifle at around $200+. Sure, higher quality products will have higher prices, but the starting point is acceptable for most players. I’ll actually talk about their most popular products (which are also good) and I’ll walk you through their offer so you can get an idea of the type of airsoft guns and accessories you can get from Elite Force. With a combination of polymer and metallic elements, this AEG rifle is a beautiful piece of machinery! Since it has a multi-positional crane stock, it works well in all sorts of situations on the field. Also, it’s quite powerful (380 FPS with .20g BBs) and features a high-capacity metallic magazine (300 BBs in one load). The rifle is easy to hold and carry and I like the large trigger guard that allows you to use gloves. Moreover, the skeletonized blade style trigger is a nice touch! Also, the rifle is equipped with a free floating Picatinny/weaver keymod rail system, which gives you the freedom to choose from a wide range of accessories. On the inside, you’ll find a MOSFET electronic trigger system powered by a 9.6v NiMH Nunchuck battery which is housed in the crane stock. Beretta ARX160 is a unique multi-role AEG rifle, with a polymer body and 6-point adjustable crane stock (so you can change the length of the rifle as needed). The stock also houses the battery (I recommend a 9.6v battery if you want a better rate of fire). The bolt release (which is one of a kind) is designed to offer full functionality to both left and right-handed shooters, and so does the ambidextrous magazine release. To increase functionality and performance, players have two RIS rail systems (one on top and one at the bottom) for all sorts of accessories. On the inside, you’ll find a metallic gearbox and an adjustable wheel-style hop-up unit. When paired with the battery, the result is quite impressive as the rife supports 360 FPS with .20g BBs and a 120 feet range. Finally, another cool feature is that the AEX160 works with most M4 magazines on the market. Perfect for most CQB situations, this bad boy is compact and easy to maneuver, even when you’re taking heavy fire. The compact design is due to the short, stubby barrel and the adjustable crane stock that also houses the battery. You also get a quad rail for your accessories and a metallic high-capacity magazine that hold up to 300 rounds. The good news is that you can use the CQC M4 in almost any field, due to the low FPS rate (up to 330 FPS). The even better news is that the rate of fire is quite impressive so you can make full use of your hi-cap mag! The NEXT GEN series comes with lots of new, exciting, and improved features, which is why I decided to add yet another M4 to the list. This one comes with an 8mm reinforced Version 2 gearbox, a new electronic trigger unit, and a quick-change spring system. As a result, the rifle shoots at 400FPS with .20g BBs and delivers accurate results due to the adjustable hop-up unit. Now, while the body is made with high-quality nylon polymer, the high-capacity magazine (300 BBs in one load) is metallic. As a result, the weight of the rifle is nicely balanced in your hands, so you won’t get tired from holding/carrying it. Moreover, you have a quad Picatinny/weaver RIS system to add any accessories your heart desires! Still, if you don’t feel like adding a scope or a red dot, the adjustable removable sights will do the job just fine. As the tactical version of the standard 1911 Elite Force GBB pistol, this model comes with a metallic body and quite a realistic blowback action. As such, I wouldn’t recommend it for beginners. Otherwise, it feels and looks like a real-steel pistol, which is why it fits in most holsters. It also has a built-in rail at the bottom, which allows you to add several accessories. Moreover, you can also adjust the trajectory of your BBs (when and if necessary) using the integrated hop-up unit. The pistol shoots at about 370 FPS and features a 14-round drop-free magazine. Finally, I like that the controls are ambidextrous and that the slider sounds extremely realistic when you pull it back. Color me sentimental, but I love a good airsoft revolver! The shape, the size, and the 6-shells cylinder are classic elements in a revolver and this one has it all! It is rather small, so it’s easy to conceal and use it as a backup to your sidearm. Of course, it also works as a sidearm, especially considering the compact size and ease of use. In terms of construction, this revolver is equipped with a metallic frame and cylinder and comes with textured grips, to make it easy to use without gloves. This is a CO2 powered revolver that fires 6mm BBs using a 12 grams CO2 cartridge which is housed inside the grip. Finally, it shoots at about 340 FPS with .20g BBs, which makes it legal to use in most CQB fields. This is a more modern-looking revolver with rails for accessories and sturdier, aggressive design. Unlike the one discussed above, the H8R from Elite Force comes with a polymer body, which makes it lightweight but durable. 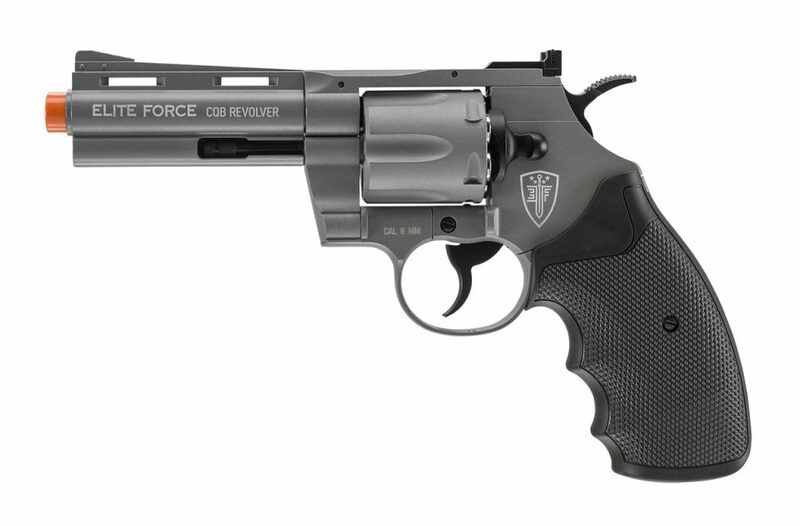 Moreover, the H8R doesn’t use shells (like standard revolvers) but a disc style magazine that can hold up to 10 rounds. As a result, the reload time is shorter and the ammo doesn’t take much space. To make it as close to a real-steel revolver as possible, the gun features a functional hammer and safety. Since it’s CO2 powered (the cartridge is in the grip), you’ll feel some level of blowback, but is not very powerful. It’s also equipped with fixed front and rear sights, so it can be used by both beginners and advanced players. Elite Force sells all sorts of products in the accessories department, from magazines, batteries, rebuild kits, grip plates, and more. They also produce and sell BBs (which are quite popular on the airsoft fields), and fuel for gas-powered rifles and pistols.